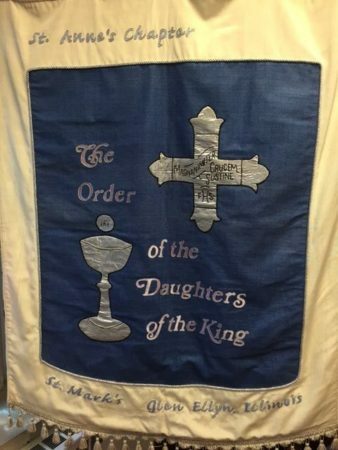 Daughters of the King is an order for women who are communicants of the Episcopal Church and churches in communion with it. St. Mark’s chapter, St. Anne’s, has been active for 85 years serving God, the clergy, and the people of our parish. As members of an International Order, we take lifetime vows of prayer, service, and evangelism and are honored to serve the people of our church. We wear a cross daily, which is our emblem. Our work at St. Mark’s deeply touches everyone. We prepare the altar for each communion service, we place the candle, oil, and towel at the altar for each baptism as well as set up the basin. We set up for Ash Wednesday, first communions, Quinceaneras, and weddings. At Christmas and Easter we decorate the chapel and prepare the altar. Daughters of the King prayerfully arranges the altar, lays out the pall, and comforts the bereaved when there is a funeral. Afterwards, we provide a reception for the family.